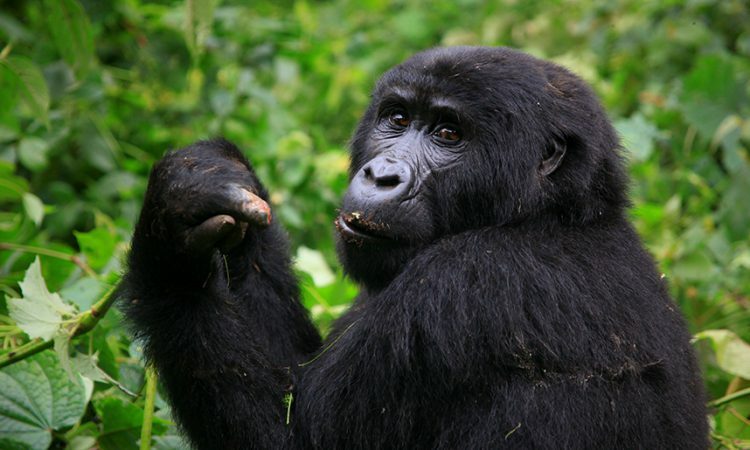 This 4 day Rwanda gorilla safari offers you an opportunity to track the gorillas in Rwanda’s Volcanoes National Park. This four day gorilla safari also offers you an opportunity experience Rwanda culture, golden monkey trekking as well as hiking the Dian Fossey tombs. On arrival, you will be met by a representative from our Rwanda safari company and transfer to Kigali city where you will embark on a city tour visiting Kimironko market and the Gisozi genocide memorial site. Have lunch and transfer to Musanze – the nearest town to Volcanoes National Park found in the northern province of Rwanda arriving in the evening. Dinner and overnight at Muhabura Hotel. You will enjoy early morning breakfast and transfer to the park headquarters with your packed lunch and bottled drinking water for briefing by the park ranger guides at 7:00am. After briefing, you will start your Rwanda gorilla trekking journey accompanied by the ranger guides in search of the mountain gorillas; this takes 2 to 8 hours depending on the movement of the gorillas. Breakfast will be served early and drive back to the park headquarters as on day 2 above. Receive briefing and either go for Dian Fossey trekking at Karisoke Research Center or Golden monkey trekking. The Dian Fossey trek is more challenging and lasts 6 to 7 hours whereas Golden monkey trekking will take you 3 to 4 hours. Return to the lodge for lunch and spend the evening at leisure. If doing Golden monkey trekking, you return early enough and transfer to Gisenyi to catch glimpse of Lake Kivu and enjoy the evening by the lake. Return to Musanze for dinner and overnight stay at Muhabura Hotel as above.